We are thinking Spring at Treadle, and today that means bunnies! Check out this assortment of bunny fabrics that range from cool and subtle to ridiculously adorable! This orange feels so cheery after the drabness of winter. Look closely on this one. Can you spot them? Can't go wrong with polka dots! And finally, here's one from our Japanese imports section. You know you need more bunnies in your life! Stop by and check these out! We have some lovely additions to our selection of lightweight cotton lawns for spring! Most notably, some new small-scale "ditsy" florals from Robert Kaufman's London Calling line, available in several colorways. Ditsy prints are easy to wear and look more neutral than bold, large-scale florals. The soft cotton lawn is perfect for spring blouses, dresses, and skirts! Yes, we do realize there is still snow on the ground. But why not get a jump on your spring sewing? Use this cold icky weather to stay in and sew, and be ready to leap out the door on that first warm day in your fresh new ensemble! 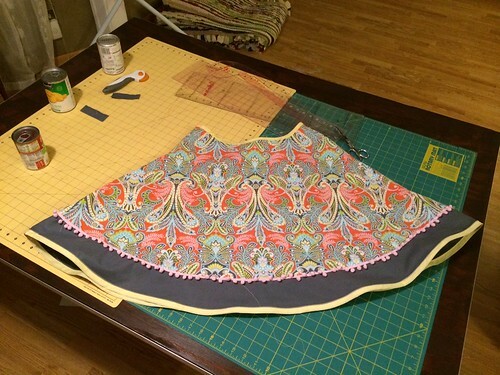 This cute skirt was spotted in our Treadle Flickr Pool. 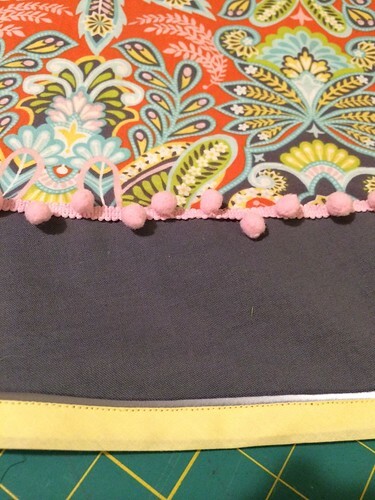 Using quilting-weight cotton in a bright print and accented with pink chenille ball fringe and reflective trim (yes, that's right!) this is a wonderfully simple project that packs a lot of pop. You can see the blog entry for this skirt over at You Can Make This. 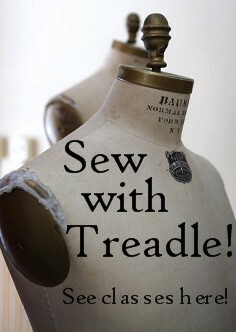 Have you made something fun recently with Treadle fabrics? Add a photo to our Flickr Pool! We'd love to see what you've been sewing. Spring is definitely in the air (finally!) Here are a couple of lovely dress ideas to get to you ready to transition to warmer weather! This green eyelet dress is made from Vogue 8985, and the construction couldn't be simpler. Elastic keeps the waist trim but still easy-fitting. What a great layering piece! The knit dress is made from Burda 6911. Knit dresses are so easy to wear. Just pull it on, add a little jewelry, and maybe a cardigan or jacket, and you are perfectly put together. Comfort and style in one - what more could you want? Stuck with Winter Blahs and need a perk in your wardrobe? This is a great season for making transitional pieces that can brighten up the end of Winter and carry you into Spring. Jackets are ideal! Here are two great new jackets made by Mary. This wild purple leopard pullover is made from Vogue 8854, a pattern actually designed for knits only. Mary broke the rules by using a woven, but went up one size to compensate. This is a fun, simple pattern with a collar that looks good worn either up or down! Vogue 8839 from Marcy Tilton is cozy but light made in a wool blend with a hounds-tooth check. The drape collar is definitely Springy! Jackets don't have to be hard! Choose a simple, unlined pattern and some great wool (or corduroy, linen, or fleece) and you'll have a fresh transitional jacket to bring you into Spring with ease. We are loving these new Giraffe Crossing flannels from Riley Blake. Soft, cozy, and bright, these are perfect for freshening up your pajama wardrobe (and don't we all need that about now?). Or use these fun animal prints with their perfectly matched coordinate pieces for a sweet baby quilt. Looking for a quick project to warm up with? Treadle has a sweet selection of Cuddle fleece blanket and scarf kits! The scarf uses elastic to create dramatic cascading ruffles, while the blankets are made with simple strips to piece together. Each kit is pre-cut and comes with easy instructions. What could be simpler - or cozier? Our Tropical Sale may be over, but there are still tons of luscious ribbons on sale at Treadle! Stop by and treat yourself to 20% off a great selection of ribbons, including designer patterns from Amy Butler, Anna Maria Horner, Kaffe Fasset, and more!